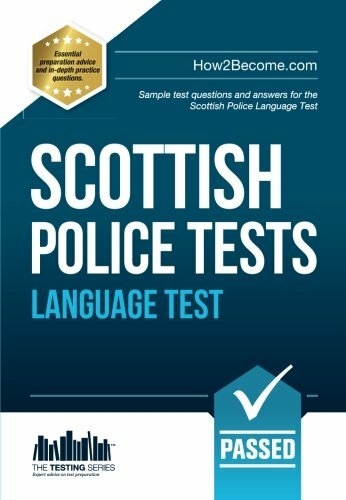 Scottish Police LANGUAGE Test questions and answers is a comprehensive testing book that covers specifically the LANGUAGE test for the police tests in Scotland. Once you have successfully passed the application paper-sift stage you will be required to undertake the Standard Entrance Test for Scottish Police Forces. The test essentially comprises of three separate test papers which include language, numbers and information handling. This book contains sample questions for the LANGUAGE test only. In order to become a police officer you must pass all three test papers before you can proceed to the next stage. So that you can prepare effectively for the Scottish Police Standard Entrance test we have created sample test questions and answers for you to practice with. You will find this booklet an essential resource in your preparation. View More In Vocational Guidance. If you have any questions about this product by How2Become Ltd, contact us by completing and submitting the form below. If you are looking for a specif part number, please include it with your message.